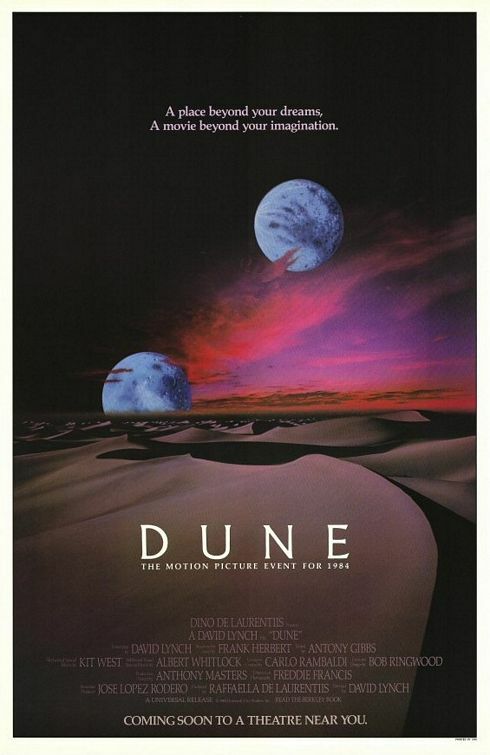 ‘Dune’- Great book, a shame about the film. Sometime, not so long ago, I was meant to go out to the pub and meet a close friend but something personal came up and he had to cancel. With no other social arrangements to fall back on, I thought I’d spend an alternative night of indoor entertainment. Cut to Blockbuster, and what do I see on the sci-fi shelf? Dune, that’s what! After double checking that it was in fact the David Lynch film and not the later TV mini-series, I paid my money and went home to watch it. Cup of tea made and biscuits out, I settled down to watch it. It all started quite promisingly with some P rincess Irulan giving a monologue about the future of mankind and the spice called malange (Virginia Madsen I believe!). Very engaging and imaginative, and not completely unlike the intro to The Fellowship of the Ring in the feelings it aroused (although nowhere near as emotive). At that point I was quite excited, especially as I didn’t really remember any of it and it was looking very promising! About 15 minutes in and the script had (quite literally) lost the plot for me. On one hand I really felt I was watching a future, alien society, which was good, but as a piece of entertainment it was almost ignoring the fact it had an audience- characters came and went with little or no introduction or motivation, lines were delivered with little context, scenes were obviously there for exposition and to just drive the plot (but seemed to be failing at both) and some of the acting was particularly poor. Despite great veterans like Max Von Sydow and Jose Ferrer. Although to be fair I’m not sure if that was more to do with the style of the production and the lines they were given as to the actors themselves. On the plus side, Patrick Stewart equips himself well and is one of the few characters to displays any convincing emotion. A lot of the characters also have a corny voice over, which goes some way to explaining what is going on (and confusing things in the process- quite a feat!) Then another character will come in and explain what is happening out loud anyway!…and it still makes no sense! A lot of things happen without much rational explanation (in the context of the universe it’s set in) and I almost got used to wondering what the hell was going on! Nobody smiles much on Arrakis.